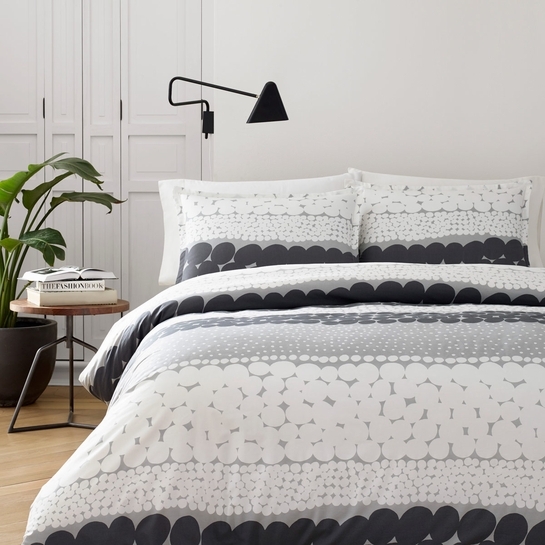 More about Marimekko Jurmo Grey Bedding Jurmo is a Finnish island that designer Aino-Maija Metsola visited on a sailing trip, where the batter of the waves created the smooth and round stones that inspired this pattern. 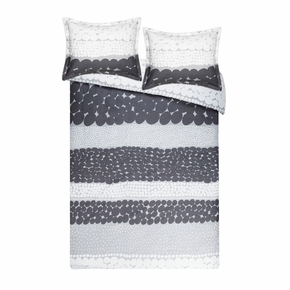 The soothing neutral tones of the Marimekko Jurmo Grey Bedding will encourage relaxation in your resting space. Made from 100% cotton percale, this soft set won't irritate your skin and is conveniently machine washable, making it as function as it is beautiful. The quality of Merimeko bedding is very, very good, and the colors are true to the online photos. This is probably my fifth or sixth order from Finnstyle. All four of my bedrooms are now outfitted with Merimeko bedding. I've purchased towels as well, they were high quality. Great colors that didn't fade. 'Love my New duvet covers. 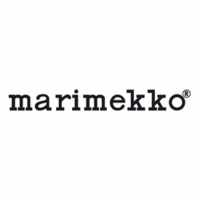 Good Marimekko guality as usual! It's beautiful! Exactly what I was looking for. Love the material! 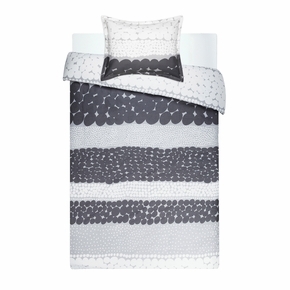 This is a very stylish Marimekko design, would love to find the grey dotted Uto sheets! This is a very beautiful series, I love everything Jurmo. The shams are well stitched and as always the fabric is sturdy and feels luxurious. Shipping was the same day!! Thank you FinnStyle! This Duvet is great looking and feels wonderful. I bought it in king size for a new platform bed and couldn't be happier. It is black, blue, and white. I thought I saw a little grey in there but there isn't any. I ended up happier than I expected. I love Marimekko bedding, good quality, and in designs you really cannot find at too many locations. Thanks Finn Style! ProsEasy to button up and the buttons are hidden. Lightweight, Large enough to cover the mattress on my platform bed, tucks in nice, and looks great with the Jurmo Sheets. These sheets are great looking and feel wonderful. I bought them in king size for a new platform bed and couldn't be happier. They are black, blue, and white. I thought I saw a little grey in them but there isn't any. I ended up happier than I expected. 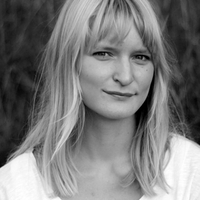 I love Marimekko bedding, good quality, and in designs you really cannot find at too many locations. Thanks Finn Style! I don't buy domestics very often. I was bored and tired with the same old stuff I had been using for way too long. These sheets and pillow cases along with the matching duvet cover were the ticket to spruce up a tired bedroom. The all cotton sheets wash well and are very soft. They also have nice deep pockets to fit my oversized king mattress. If you love blue as much as I do, just buy them. Received this item with super quick shipping. I purchased a down alternative comforter thru another online store and it was oversized king. This Duvet Cover fit it perfectly. In the end it dressed up my bedroom with the exact Finn look I wanted. Beautiful graphic, crisp feel to the linen, exactly what I was expecting. I am a huge Marimekko fan and these sheets do not disappoint. Love the Marimekko Jurmo Sheet Set! Thoroughly enjoy the 4 sets of percale Marimekko sheets I've indulged in over the past 2 years - each a different design (and all on sale ... my Finnish father would have approved!) The 5th set, Jurmo, is my absolute favorite ... the rich, smooth texture combined with the comforting blue and white pattern (my Finnish mother's favorite colors). Love it so much, I had to get a second set, on sale, of course! Kiitos! I haven't had Merimekko sheets since I was little and I was so excited to find these! The design is whimsical and beautiful and they're made with a good quality cotton. So much fun to crawl into these at the end of the day! 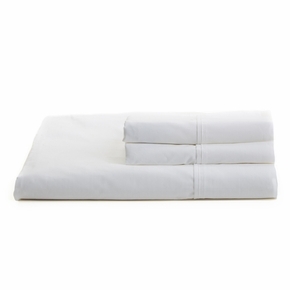 Are there any pillow cases in stock of the Jumo Perale Bedding? Hello, Unfortunately the Jurmo pattern in bedding has been discontinued and we will no longer be getting more in stock. Need matching shams standard - do you have? This design has been discontinued by the manufacturer and we have since sold out of the standard shams. Our apologies.